In June 2017, Teaching for Change presented two workshops at the National Family and Community Engagement Conference in San Francisco, Calif., in front of crowded audiences. 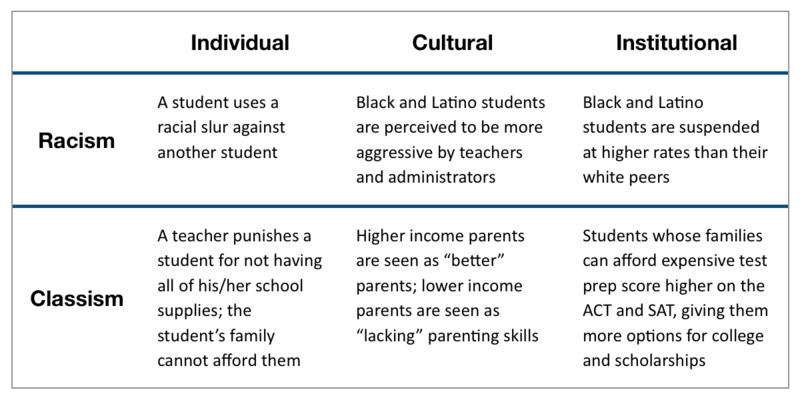 Unpacking Race, Class, Privilege, and Power: Making the Case for Race and Equity Training explored the roots of systemic racism and made modern-day connections to how race, class, and equity issues intersect with family engagement. This session was designed to help administrators make the case for equity-based professional development and develop equitable family engagement strategies. Community Organizing for Educators: Techniques to Build WITH Families, provided a rare opportunity for educators and administrators to receive an introductory training in community organizing, a valuable framework for engaging parents of color and lower-income families. The workshops were facilitated by Allyson Criner Brown, Teaching for Change’s associate director and editor of Between Families and Schools: Creating Meaningful Relationships. More than 100 people crowded into a room meant for only 60 participants as the workshop began with The Color Line, a free, downloadable teaching activity on the countless colonial laws enacted to create division and inequality based on race. The Color Line is a renowned lesson from the Zinn Education Project, a collaboration between Teaching for Change and Rethinking Schools. It helps students – and educators – understand the origins of racism in the United States and who benefits. Parents with higher education and income receive more information about their children’s education because they have been socialized to ask questions and challenge authority. These parents have greater access to information to know what kinds of questions to ask to get the most information. Various hidden fees in schools – such as field trips, fundraisers, snack/pizza money, or spirit week costumes – can be difficult for families to afford. While these activities are not necessarily required, students and families may feel pressured to not be left out. When families are displaced from their neighborhoods but still want their children to attend the school, their commute can be long and difficult, leading to attendance problems. Finally, each person strategized with a partner about how to make the case for equity-based professional development in their school or district. I learned a lot about racism from the past to the present. The scenarios helped me better understand. Awesome, enlightening discussion that needs to continue to be put into action. I have been empowered even more and will take back with me: 1) the fight is not over, and 2) by all means necessary, we must change things for the better. Teaching for Change’s second workshop was designed to introduce educators to the tenets of community organizing. The session began with a discussion of the “Building Stronger Schools with Parent Power” video that documents a parent organizing victory for afterschool funding at a Teaching for Change partner school. After discussing the elements of community organizing that were evident in the story, participants delved into the Tellin’ Stories approach and assumptions for a deeper understanding of community organizing as a framework for family engagement. Be different from the system, lead as an example on your campus and take time to build intentional relationships with families. I love the Tellin’ Stories assumptions – I will take that back to my organization. Also, reminding ourselves to be different than the system. I believe that people can affect change on a large scale in my community but sometimes I forget that. Now I remember and am ready to continue the work. Thank you! Encourage school leaders to be more proactive in building relationships with parents by being visible and available. Teaching for Change staff led a similar workshop that explored community organizing and popular education, Family Engagement for Radicals, at the Free Minds, Free People Conference in Baltimore in July. Read more about the Tellin’ Stories approach and watch videos here and here, and download our family engagement guide.